What's brown, stands about 5' 10" tall, have four legs and quite woolly? I had a pleasant surprise at work this morning. There's a morning TV show here in Vancouver called, 'Breakfast Television,' produced across the alleyway from where I work. 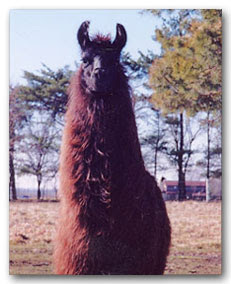 Carolle phoned me to say that a brown llama named, Creme Brule, was a guest and awaiting her cue to go on. The show is broadcast every morning and on this particular morning it was held outside in the parking lot. All the better, because a barbecue was going up and a four legged guest was due up. Mind you, not as the barbecue! About a half past eight in the morning I saw a woman next to a very large brown llama. Ok I had a second take as the rather large, brown, woolly llama was grazing on our little patch of grass. With coffee in hand, I walked over to the llama and talked to it's owner. The llama's from an Aldergrove, BC farm, fully grown around my height with big brown eyes. You never know about these llamas as I talked to the owner and spied from the corner of my eye. I've seen these critters spit, on TV, and I was ready to duck. Anyways it never happened, as I stood there it was quite surreal standing next to a real llama, my first. Creme Brule was very relax and quiet probably due to the early morning as she waited for her cue. It's good that the TV folks decided to have it outside today, as the alley was fairly quiet. On any given day it's like an F-1 race. The owner said that Creme Brule arrived in her Chevy Astro van curled on the floor. No special vehicle for her. And that tomorrow she's part of a Canada Day event. Thats one busy llama. I wonder how much she makes on the talk show circuit? I never had the chance to ask that question. As they got the cue to go back on, I wished the owner and Creme Brule a good day. I walked back into work ... smiling.